Contemporary Mexican fiction is the place to be. If we’re still including Roberto Bolano in the category, which I am. 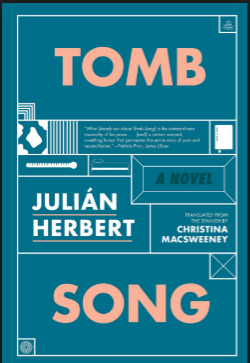 Julian Herbert’s new novel Tomb Song, translated by Christina MacSweeney, shares a love for language with much of the contemporary Mexican fiction I have read. What language can do, the way it can excite, anger, frustrate, is something I’ve found to be a common denominator in contemporary Mexican fiction. Mexican writers love language for its own sake and are not afraid to let this love shine. Yes, I understand that I am reading it in translation, but still. I’m excited by the language in Tomb Song in part because I read it for The Rooster’s Summer Reading Challenge over at The Morning News just after finishing Tayari Jones’s wonderful novel An American Marriage. Ms. Jones’s book was second in the challenge but library due dates forced me to read it first. While I enjoyed her book, I did find the language lacking. It’s well written, but it’s really journeyman language, the stuff of professional story telling sure, but the stuff of airport books. I use the term “airport books” respectfully as someone who loves to read them while travelling. No street, no way to know where we are going with our brothers and sisters. Just someone, or something, in our blood telling us that we have to keep going even if we may not be going anywhere. There’s nothing remotely like that in An American Marriage though there was plenty of opportunity. I learned from reading the discussion at The Summer Reading Challenge that Tomb Song is creative autobiography, that Mr. Herbert is giving us a version of his own life. He shares the name of the novel’s narrator and main character. I’m pleased to discover that he has come to a happy ending, because it did not look like he would. While Tomb Song is never sad, not even then it’s cutting very close to the bone, for me anyway, like it did in the above quote. It could have been, probably would have been in the hands of a lessor writer. The story concerns Julian, a poet and author, who is reunited with his mother as she lays in the hospital dying from leukemia. He is the only one of four siblings who is able and willing to take care of her as she lays dying. She was at best a problematic parent. For most of her life she made her living as a prostitute; each of the siblings has a different father. As Julian cares for his mother he recalls moments in the life they shared as well as moments in his own life. Many of these are realistically portrayed, some appear to be the result of a fever dream or some sort of dream state so we’re not sure how real they are. Though they do reveal much about him and about his relationships with the other characters. At times we get excerpts from diaries and other things Julian has written. But Mr. Herbert makes the readers do their fair share of the work. He will lead the way but he has no intention of spelling things out as clearly as some readers expect. Which is one reason why I liked this book as much as I did. It’s also something pretty common in contemporary Mexican fiction.